Microcom Environmental designs and manufactures industry-leading satellite communication & logging equipment for environmental monitoring applications. Hosting a suite of products for data collection, data reception, & data presentation, Microcom Environmental is the go-to source for all of your environmental monitoring data needs. We also provide integrated environmental monitoring systems with precise and reliable sensors for a wide variety of applications. Whether you're looking for a turn-key system, a custom designed system, or products to integrate into a system, Microcom Environmental has the solutions for your application. Reliability is critical when it comes to environmental monitoring. Whether the mission is to protect lives, infrastructure, or the environment itself, data reliability is of the utmost importance. That's why Microcom Environmental utilizes satellite telemetry – so the end-user doesn't have to worry about cellular throttling, heavy network congestion, and data fees. Global coverage in satellite telemetry options include GOES, EUMETSAT/METEOSAT, INSAT, Himawari, ARGOS. And, with a variety of sensors and data collection platforms designed for different applications, Microcom Environmental has a data collection solution for any application. Microcom Environmental is the industry leader in satellite telemetry receive technology for environmental monitoring data. As the prime contractor for NOAA's GOES DCS Receive Systems, Microcom Environmental continues to innovate the receive product line to continue delivering the most reliable solutions. Microcom Environmental offers Direct Readout Ground Systems for optimum reliability and minimum latency, LRIT/HRIT Receiver Systems for budget constrained missions with a need for maintained reliability and relatively low latency, and an internet-based reception option for low budgets. What is data if it isn’t organized for your preference? 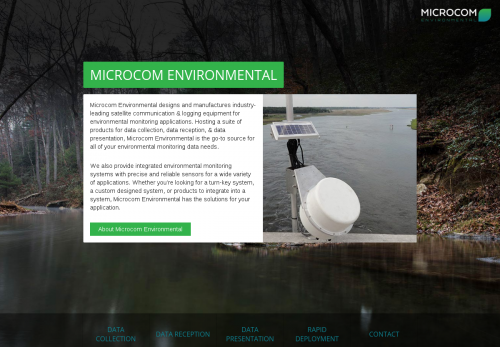 At Microcom Environmental, we provide data reception software, custom-designed data presentation websites, SQL databases, and map-based user interfaces. Our data presentation team provides the flexibility to design a fully customized data presentation platform, while delivering excellent support after delivery. Our commitment to our customers is to always provide the most durable, reliable, and cost-efficient products and solutions. And with a knowledgeable support team, we take the hassle out of maintenance. Microcom Environmental’s feature product is the XPress, a fully integrated data collection platform. The XPress consists of a data logger & satellite data transmitter, transmit antenna, solar panel, battery pack & integrated solar regulator, and a GPS antenna. Because of its integrated nature and mounting application, the XPress is perfect for rapid deployment for extreme weather events, seasonal monitoring, environment restoration monitoring, disaster monitoring, and quick replacement of broken or malfunctioning data collection platforms. We provide a variety of different mounting options; or just attach the XPress to a tree, existing structure, or any other temporary or permanent solution. Although the XPress is an incredibly reliable solution for rapid deployment, it’s perfect for permanent monitoring as well. Please enter your details below and Varysian will enable communication with Microcom Environmental.